1 GT2 16 teeth pulley. 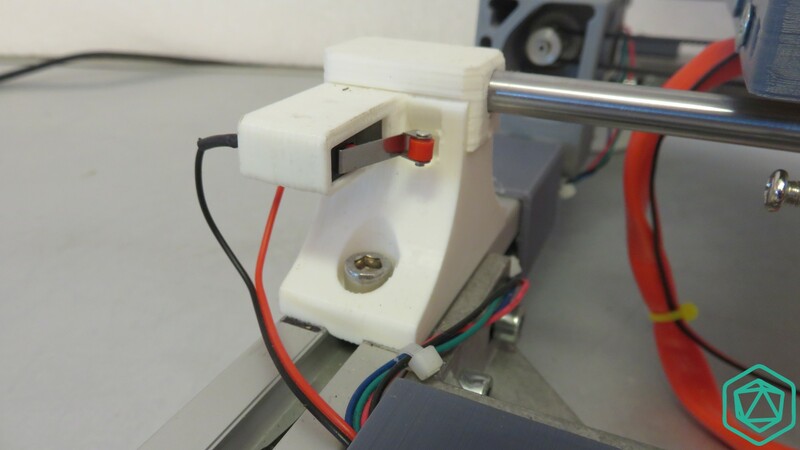 Start by placing the plastic part over the stepper motor. 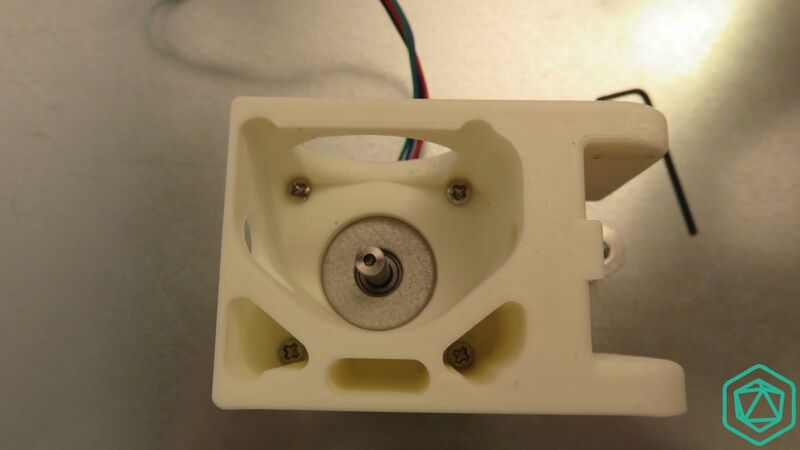 For some wiring consideration, make sure that the stepper motor wires are placed on the same side as the big hole on the side of the plastic part as shown on the picture. Insert and screw the 4 M3X8mm screws at each corners of the plastic part. If you have a magnetized screw diver, this will help you achieve that. 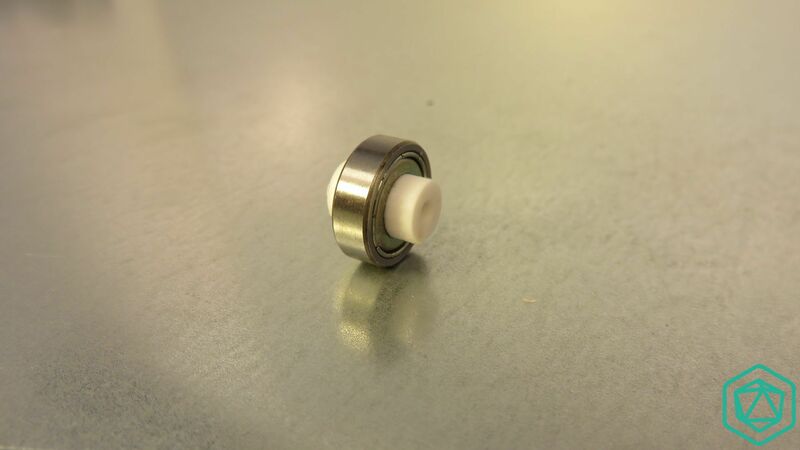 Start by taking the 2 small plastic washers and insert them inside the bearing. 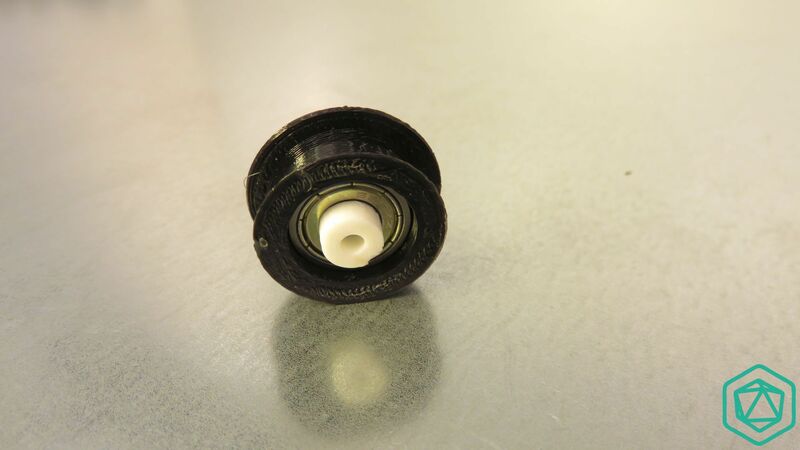 Then insert the bearing inside the dedicated plastic cage. Here is a back view of the assembly. 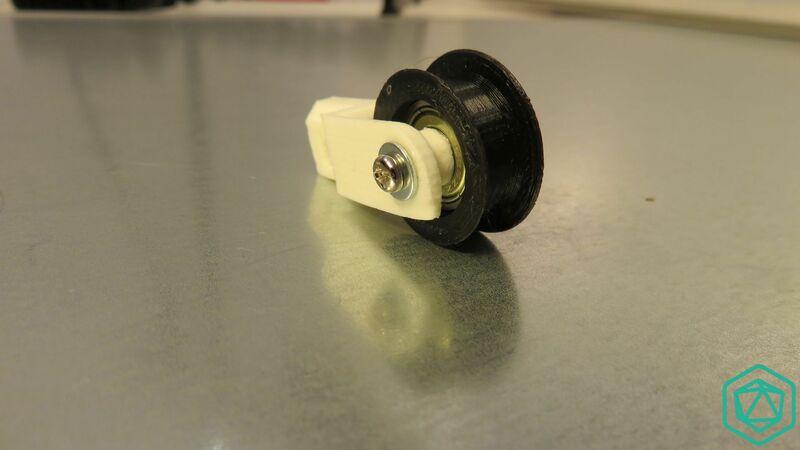 Take the fork shaped plastic stretcher and place in the middle of the fork the bearing assembly. Then add a M3x25with a washer on one side and close it with a washer and a M3 Nut. Now insert on the small slot on the side of the fork stretcher a M3 Nut that should fit perfectly inside. Take a moment to make sure that the hole of the Nut is aligned with the one of the Fork stretcher at the back of it. 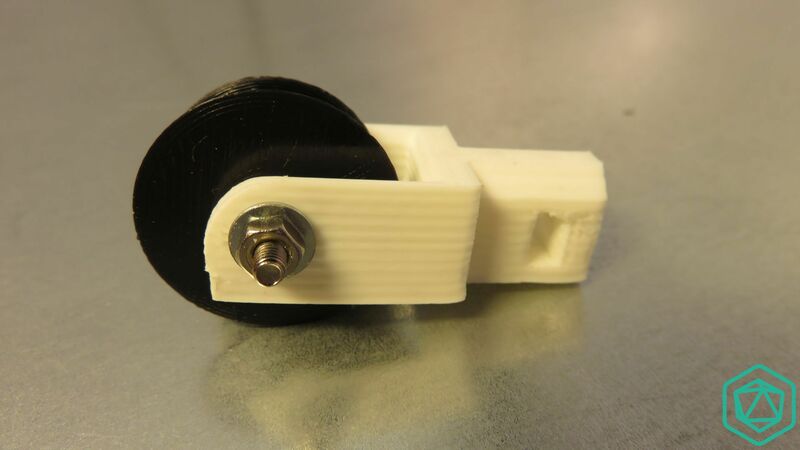 A side view of the part showing the Nut and it’s washer. Now take the Stretcher support and insert a Screw and a washer on the back side of it. 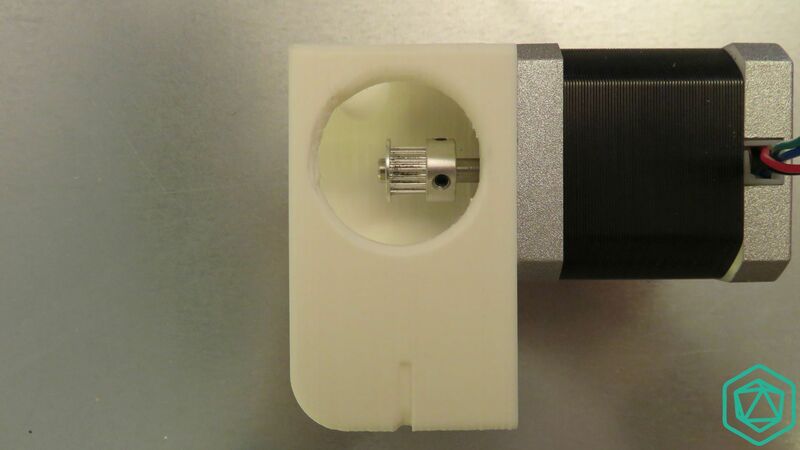 This picture shows the front view of the support and you can see in the middle of the slot the screw coming toward us. 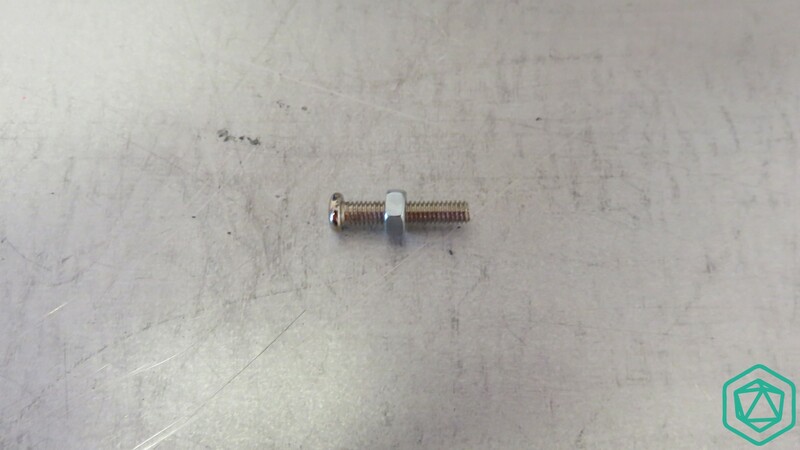 This pictures shows the other side of the same part, with the screw and it’s washer. Insert the previously assembled part inside, make sure the triangular shape of the stretcher fits inside the support, and slightly screws the stretcher on the screw to keep everything together. Scalar XL: 300mm from the side of the chassis. 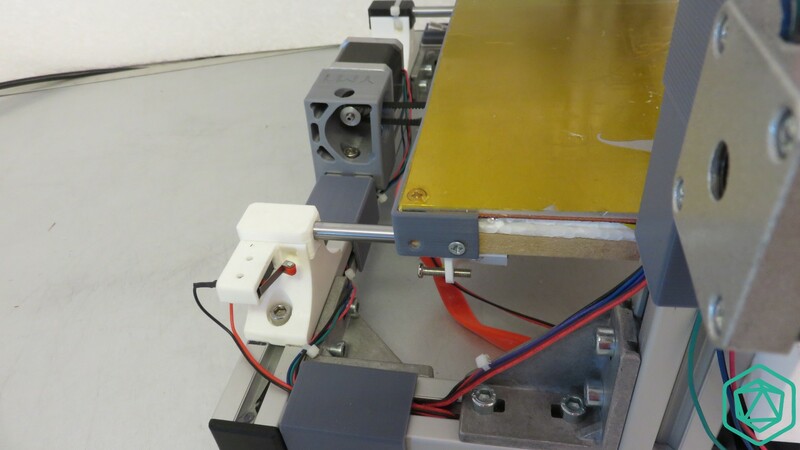 Place the motor assembly on the opposite side of the chassis, at the middle of the extrusion profile. 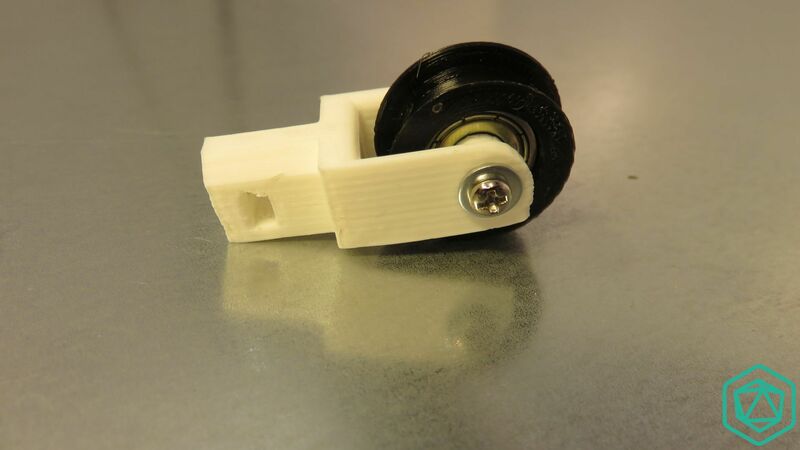 The goal is to link the belt tensioner, the motor and the belt holder all together using the GT belt. The video shows you how to use the belt stretcher. 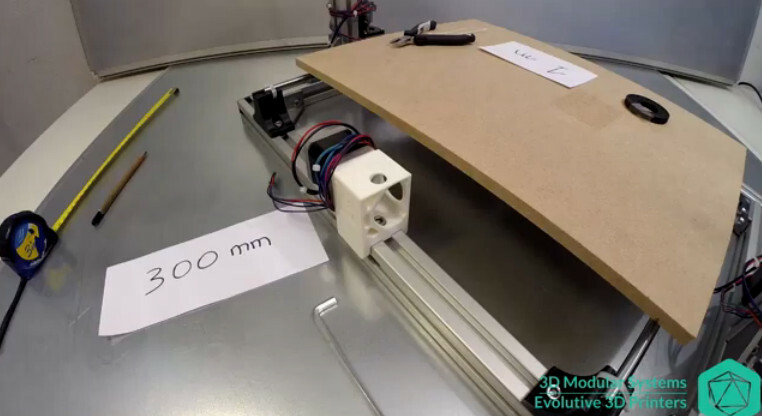 Cette entrée a été publiée dans Axe Y, Imprimante Scalar X10, Imprimantes, et marquée avec belt, Idler, motor holder, Y Axis assembly, le 16 May 2015 par 3D Modular Systems. 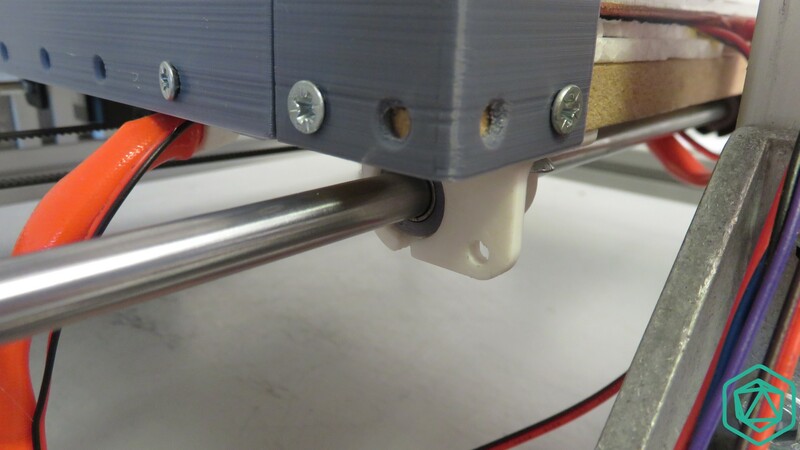 1 smooth rod support integrating the pre wired end stop. 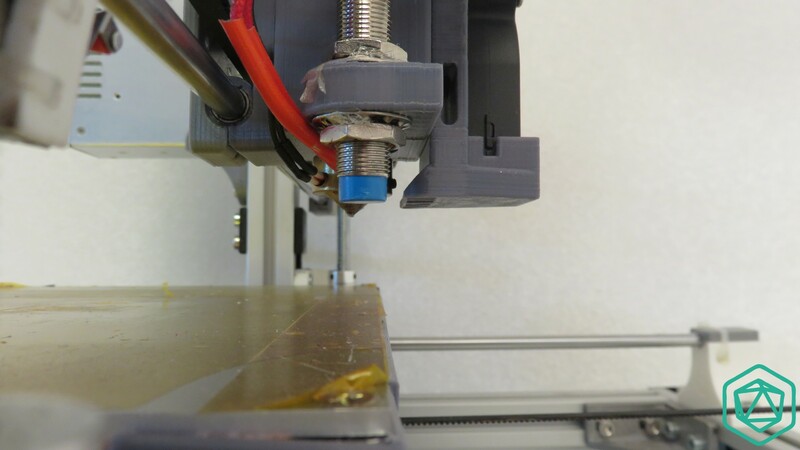 Take the plastic part looking like a hook and clips it over the smooth rod near the X axis motor support . 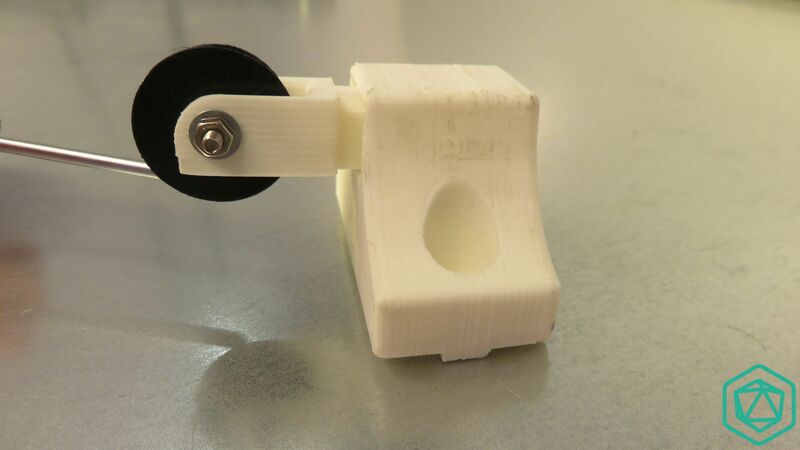 Now take the end stop with the wheel and place it so that the wires are on the outside of the machine toward the stepper motor, and make sure that the wheel is heading toward the smooth rod. The main prupose here is that the wheel would hit the X carriage to signal to the electronic that the carriage has reached the MIN position on X axis. In order to allow the more natural position of the end stop’s wire, just make sure they go behind the threaded rod, between the threaded rod and the aluminum extrusion as shown on the picture. Also secure the end stop on it’s support using 2 cable ties. 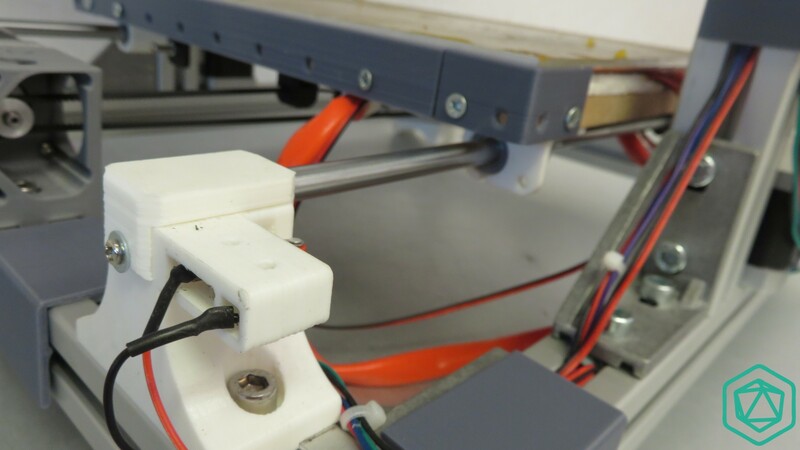 Bring the X axis carriage against the end stop and check that the wheel is properly pushed by the carriage and that the probe wire is well positioned. 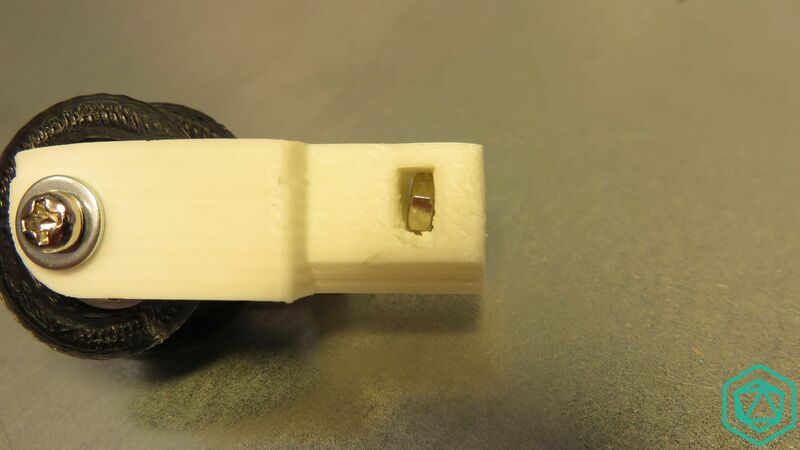 If the probe wire is causing trouble, you might consider placing this end stop on the bottom smooth rod. 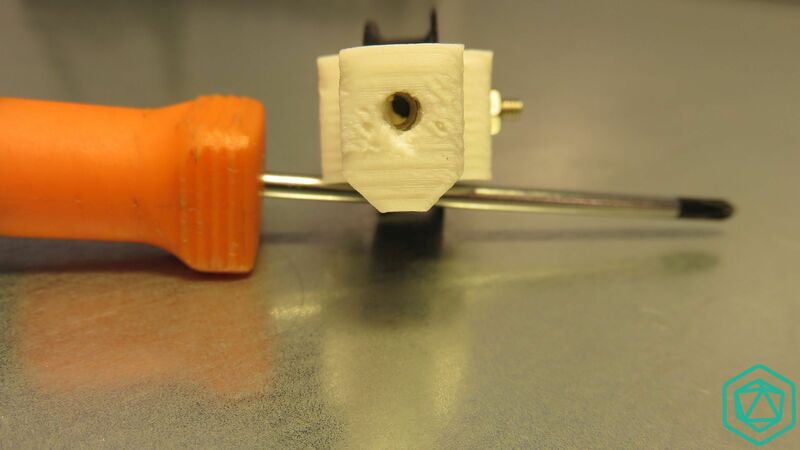 Also check that the end stop support is not moving on the smooth rod to avoid possible future issues. This picture shows the front view. The end stop is pushed against the x Carriage. At this moment check that the nozzle position over the heat bed is reaching the border of it. If it’s not the case, just readjust the location of the end stop a little bit in order to achieve this goal. In order to make sure tat the end stop is properly attached to the smooth rod, you can constraint it using the cable tie and secure the end stop lead wire with it as on the picture making sure it’s going behind the threaded rod. We are going to install here the end stop of the Y axis . This items should already be assembled . You might need to remove the protective scotch however before using it. You should have on your chassis 3 identical heatbed smooth rod supports and 1 other with the integrated end stop holder. 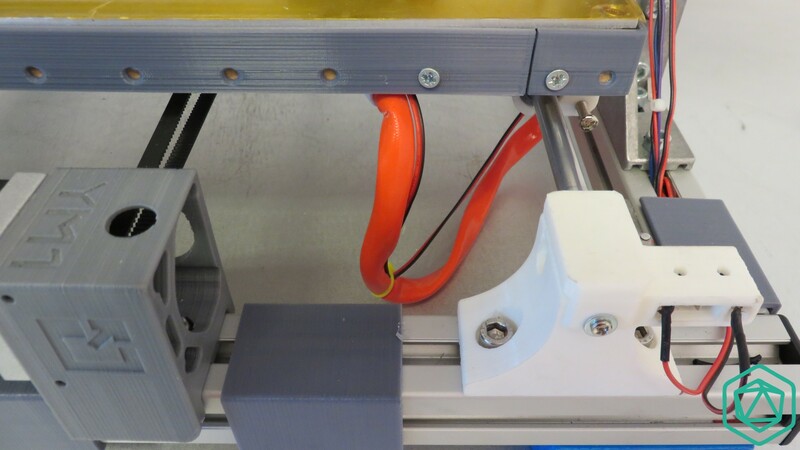 It is to be placed on the opposite side of the power supply, also on the opposite side of the Y axis motor on the same extrusion profile. These 2 pictures should help you to locate the proper position of it.on your machine. Now take the M4x20 screw and it’s 2 M4 nuts. 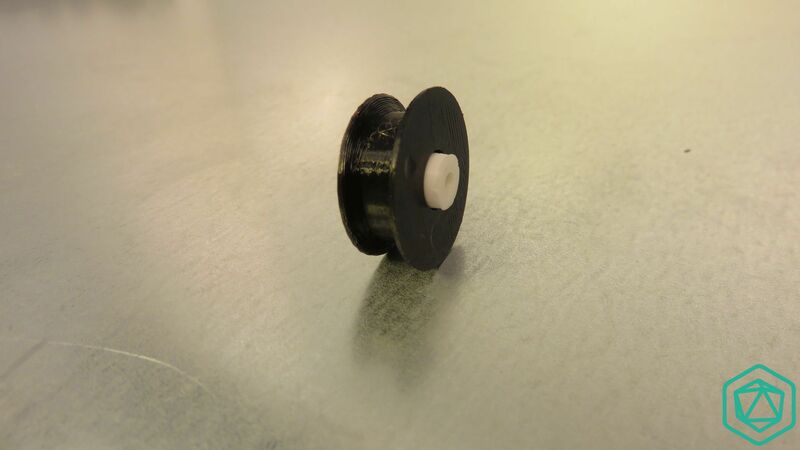 Place the nut at the middle of the screw thread. 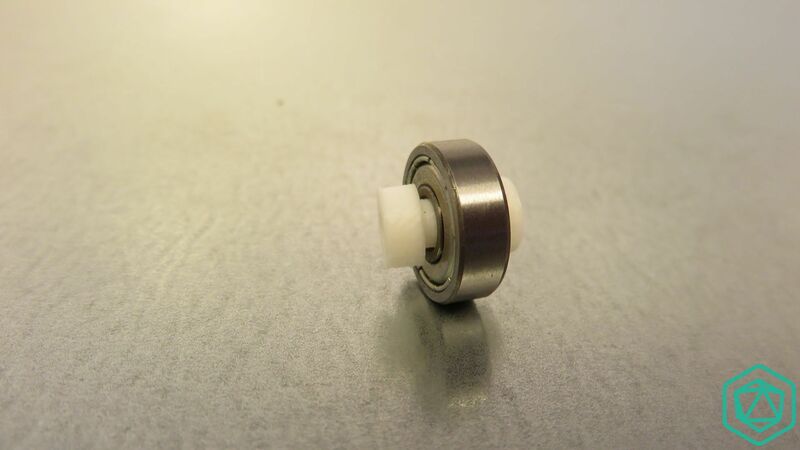 Under the heatbed, you should have a special LM8UU linear bearing holder with a hole dedicated to this screw . 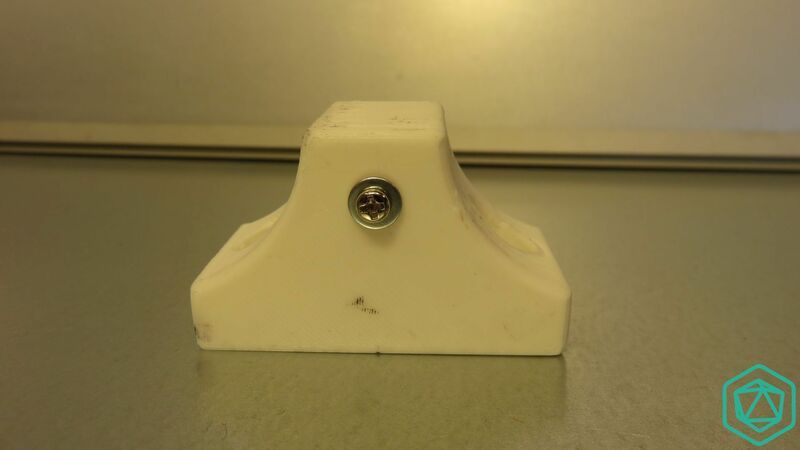 You should have this support aligned with the end stop holder. 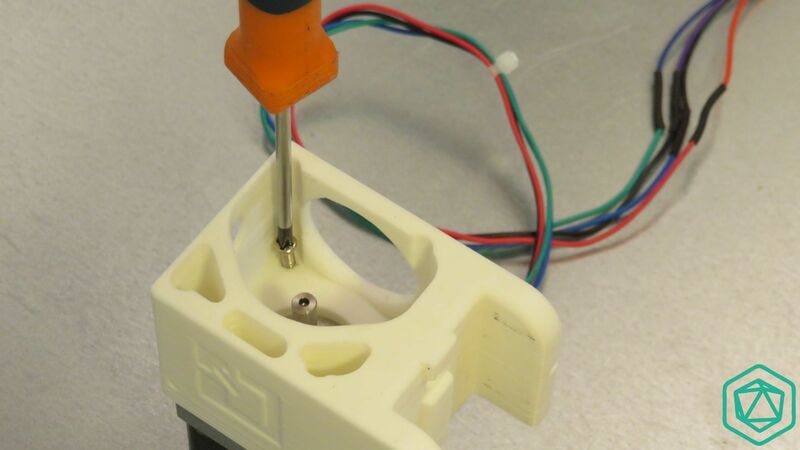 Adjust the screw depth so that the nozzle tip reach the edge of the heat bed. Secure the Screw using the left over M4 nut. 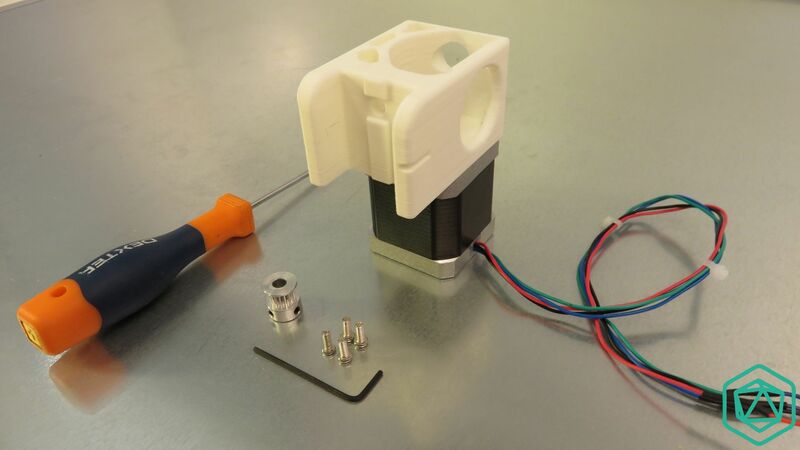 Now you are going to assemble the Y axis end stop. Take the plastic support that is compatible with 30×30 slots. 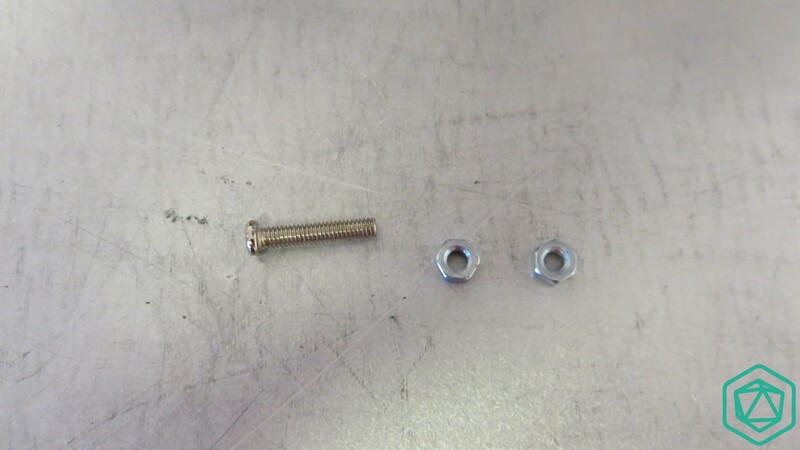 Prepare a set of M6x12mm screw and a T-Nut. 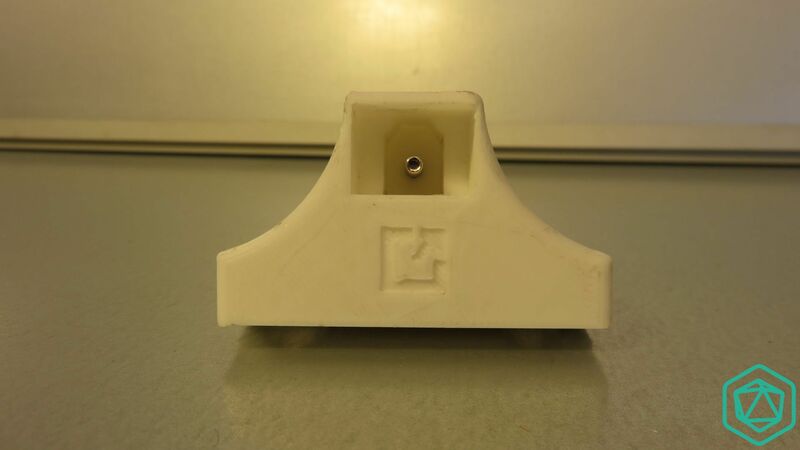 Place the end stop so that the contact side is placed toward the outside of the part. Also center the end stop so that the dedicated holes on the plastic part for securing the end stop are aligned with the end stop holes. The photo shows you how to place it. secure it wit 2 cable ties. 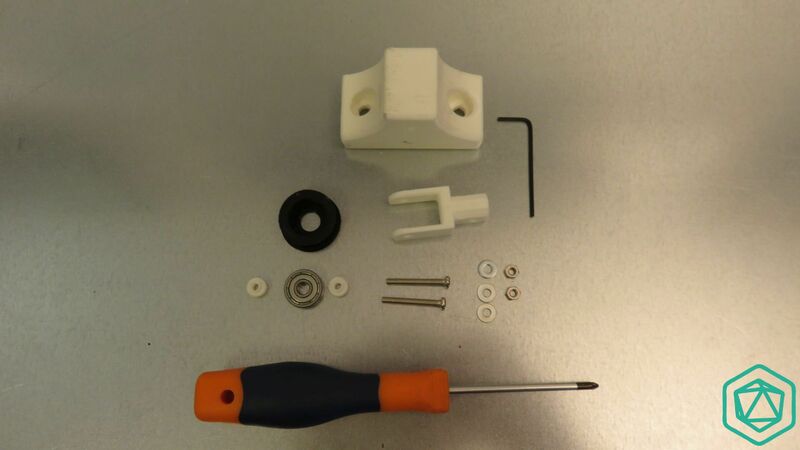 A good tip is to make sure that the cable ties heads are placed on the left of the plastic part. The picture should help you to place them properly. 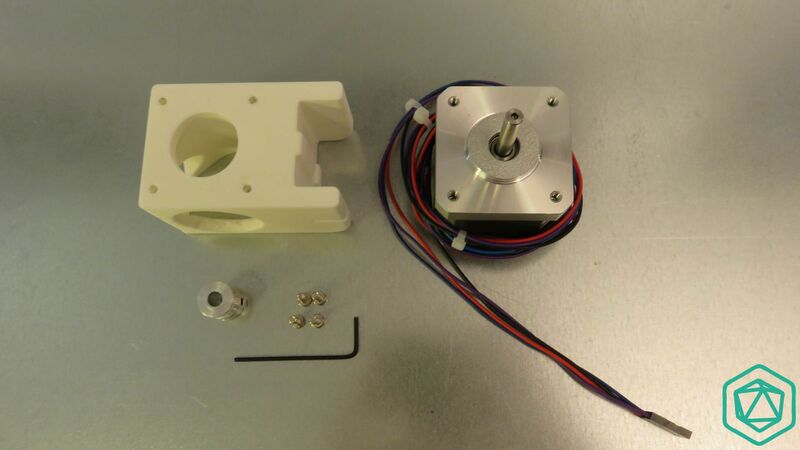 Place the whole assembly on the side of the Y axis motor near the YMI marked plastic part. The lead wire of the end stop can be placed like on the picture, afterward the motor wires and the end stop wires will follow the some path. The inverted view shows how the end stop contact is located and how the wires are going to be placed. This position is also nice to protect the contact metallic plate from being broken. Under the heat bed, make sure to be on the opposite side of the heat bed power cable. 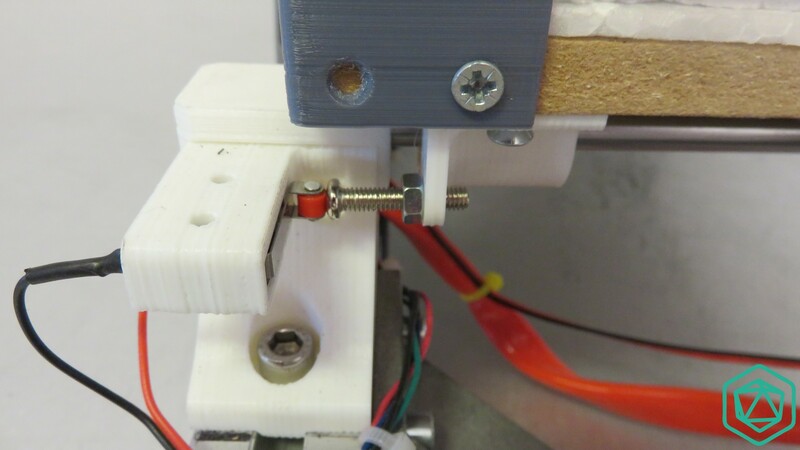 Now take as reference the linear bearing support located the closest to the Y axis end stop. From this starting point, measure 100mm (10cm) on the right of it and then go down 25mm (2.5cm). Then make a mark. Then go right again for 10 mm (1cm) and make a 2nd mark. Now take the finger holder and place the 2 wooden screws to secure it in place at the location of the previous marks. 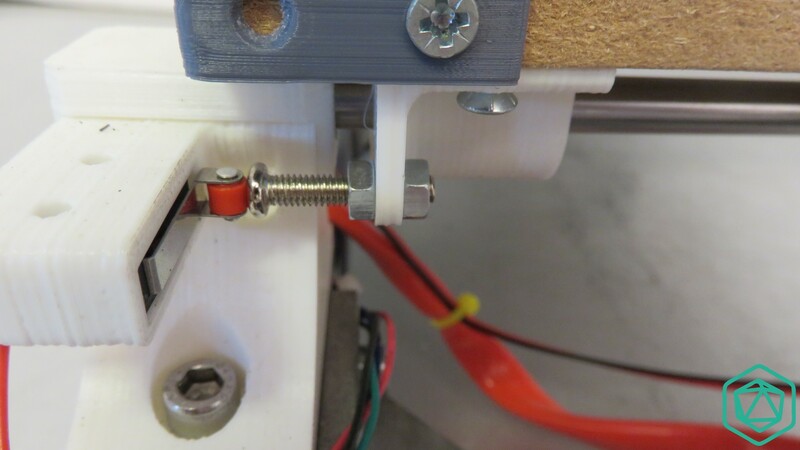 A M3X20mm screw and 2 nuts are to be used in order to adjust the Y MIN position of the heat bed. 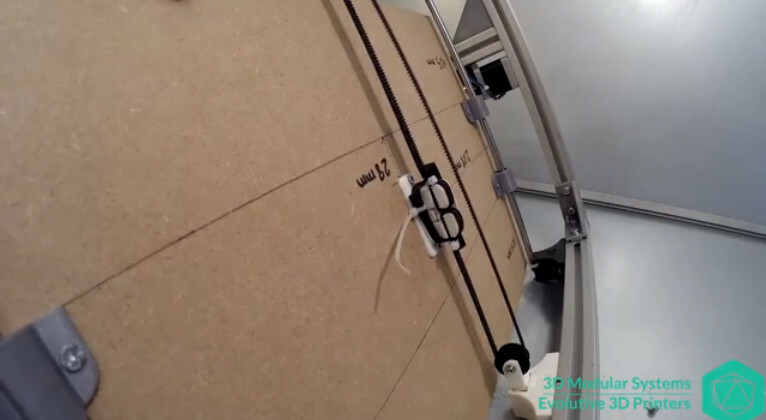 Cette entrée a été publiée dans Axe X, Axe Y, Chassis, Electronique, Imprimante Scalar, Imprimantes, Scalar XL, et marquée avec end stop, setup, X axis, Y axis, le 14 May 2015 par 3D Modular Systems.